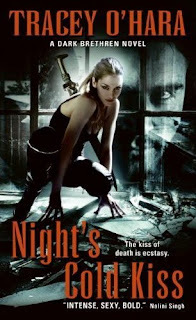 Night's Cold Kiss by Tracey O'Hara officially released yesterday along with a slew of other terrific urban fantasy titles. What a great way to wrap up the summer. In celebration, I have 3 copies of Tracey's book up for grabs. You'll have to do a little bit of research to qualify. To enter you need only leave a comment, but you must include one fact you know or learn about Australia. After all Tracey is from downunder. Contest is open to residents of Canada and the United States. Link to the contest for an extra entry and leave a link. Make sure you leave a way for me to contact you if you win. Contest open until Friday, September 4 at Midnight. 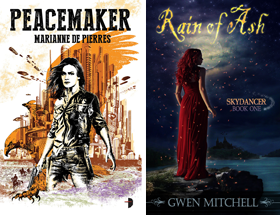 Winners will be announced in my Saturday Urban Fantasy Weekend Report on the 5th. Koalas are mean. I was shocked when I heard this. They look so cute and cuddly! We had a foreign exchange student from Australia when I was in high school, and she told us how the koala's used to pelt them with bananas and were generally grumpy. Jackie you thinking maybe she was pulling your leg? They are so cute. Tez indeed I plan a post once the contest wraps up. I'd LOVE a chance to win! Thanks for hosting! I'm so glad I stumbled across your blog. I'm having some giveaways as well (like 20)...you should stop by. Not all books either...a bookshelf and gift-certificates. OK..My answers for your contest are. Actually Jackie is half right - they can be a bit mean. They scratch and bite, especially wild ones. But as for the banana’s - I think she was having you on, sorry Jackie, the only eat a special kind of eucalyptus leaf, so they wouldn’t be interested in bananas at all. Tez - I agree - these guys are doing very well. And even though our anthem is Advance Australia Fair hardly any of us know the words. Waltzing Matilda is the unofficial anthem - A song about an out of work itinerant hobo who commits suicide by drowning himself in a small water hole, rather than get caught for stealing a sheep. Yep - that just about sums us Aussies up. Rachael summer at Christmas - kind of like Florida for Canadians. Cool cfisher I'd heard joey but not the others. PA Princess I'll definitely drop by. Jen I like the water fact! Tracey I have my own Australian song trivia. I once met the father of Rolph Harris the musician that wrote Tie Me Kangaroo Down Sport. Christmas time for us is bbqs, the beach and backyard cricket. Now cricket is another topic altogether. Please enter my name in this great draw. Thanks. IMDB says, "No fewer than 15 babies were born to cast and crew, one being Kidman's daughter, during the course of the very long production." OH, you meant the country/continent? In that case, Wikipedia says, "Approximately 24% Australians over the age of 15 regularly participate in organised sporting activities in Australia." Australia's largest annual outdoor sculpture exhibition is called Sculpture By The Sea. It started in 1996 at Bondi Beach(Sydney) and a companion event began in 2005 at Cottesloe Beach(Perth). Apparently, over 50 local, interstate and international artists participate in the exhibition every year. I'd like to enter too. One fact about Australia is that the day of the Melbourne Cup (a horse race) is a public holiday in Melbourne. Well. When I was growing up in Sri Lanka I used to remember people used to say that the population in itty bitty Sri Lanka was about the same size as the population of Australia. Just to say: there's a lot of land in Australia where people don't live. Thanks for the unexpected contest. I have heard and seen people playing a didgeridoo and it can be some amazing music. From watching Animal Planet, I know that Australia is home to some of the most venomous snakes in the world. Well Tracey my research shows that John Williamson wrote the song and can be be seen performing it on this YouTube video. Colleen I remember seeing that in an Australian movie about the moon landing. Wanda - what no Australian factoid? Pissenlit be sure to take pictures! Number 6 Jessica? I never have guessed that. Jenny a perfect excuse for a holiday. Her in Canada Newfoundland has a holiday defined as "the first sunny Monday in June"
Kinda like Canada Janicu - lots of space and few people. LOL Cybercliper that's the spirit! Sara do I have to name the capitals? Thanks for the plug Donna. Love the sound of the didgeridoo. Ooh! I soooo want to read this!! Trying for a copy on another site. Oh I hope I win somewhere!! Count me in! Sorry! Just re-read the post and saw I had a question to answer! I'm not entirely sure how accurate a fact this is, but I heard, from The Simpsons!, that the toilet flushes the opposite direction there! there are over 700 different snakes in Australia (700!!! ), and they're some of the most poisonous snakes EVER! Please enter me, it sounds wonderfully fantastic! Nothing new, but Australia is an island! And its native to koalas and kangaroos. I love this contest - thank you SciFiGuy for having it. It's great seeing my country through your eyes. Yes we do have lots of creepy crawlies over here that are just plain deadly. John Williamson is right - I loved that song when I was a kid. Besides the "cute" looking koala and the kangaroo we have a funny little marsupial can the Tasmanian devil (you know from the looney tunes cartoons). Now he is one vicious little creature who is unfortunately endangered due to a disease that is afflicting them. If there is anything you want to ask me about my country - I will try to answer. They're home to koalas and kangroos. Froggy thanks for the shoutout! Dottie the flat thing is interesting. Cool fact. Daelith. Spiders. Yech. Snakes I can take. Spiders not so much. Hi Tracey. I have always found Australia fascinating. It seems isolated geographically and by time. One of those places I think everyone would like to visit some day. Gotta love the Tasmanian Devil. Carrie the two K's are pretty popular. Bridget now that is truly different. Due to the fact that Australia is on the southern hemisphere, at the other end of the Earth's tilted axis, its seasons are reversed from what we in the northern hemisphere think of as normal. For example, December is actually a summer month there and August is in winter. The name Australia is derived from the Latin Australis, meaning "Southern"
Summer in the US is winter time in Australia and when it's summer here, it's winter in Australia! Australia is also the home of Hugh Jackman! I went to Tracey's website to read more about this book and I am definitely intrigued by the plot. It sounds great! Regarding Australia my brother studied in Perth at the University of Western Australia in Perth on a Rotary scholarship. It blew my mind how opposite their weather was from ours. Anyway, in honor of my brother I will post a fact about the University: "The University of Western Australia, which was founded in 1911, is renowned as one of Australia's leading research institutions. The university's monumental neo-classical architecture, most of which is carved from white limestone, is a notable tourist destination in the city. It is the only university in the state to be a member of the Group of Eight, as well as the Sandstone universities. Thanks for the chance to win, "Night's Cold Kiss" looks like a great debut read from everything I have read about it. NIGHT'S COLD KISS is already on my wish list! It sounds great! 1. Australians don't think Fosters is codeword for beer. My friends had never even heard of Fosters until they arrived in the States. 2. Nevil Shute wrote a book called "A Town Like Alice". It tells the story of Jean Paget; as a prisoner of war in Malaya during World War II and then her return to Malaya after the war where she discovers something that leads her on the search for romance and to a small outback community in Australia where she sets out to turn it into 'a town like Alice'. What I loved about the book is that they called baby lambs "poddies." The cartoon Tasmanian Devil doesn't look like the real one at all! Australia is home to the kookaburra, which is also found in New Guinea. I loved that song--kookaburra sits on the old gum tree...--when I was a kid, sang it for hours! A not-so-important-to-anyone-else factoid: I have family in Perth, Melbourne, Sydney, and Brisbane. I so need to visit! Thanks for introducing me to another new author. Thanks again for another awesome book giveaway! If you visit Gundagai (New South Wales), you can see the Dog On The Tuckerbox statue. And if you go the third week in November, you can attend the Dog On The Tuckerbox Festival. I had never heard of it until a friend sent me a keychain from there.